Oil usage in the BMW N54 twin-turbo 6-cylinder engines is quite common. 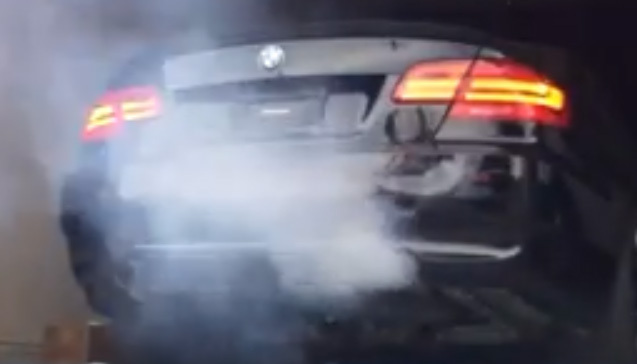 Not only is this inconvenient and potentially embarrassing (oil smoke from the exhaust), it’s unhealthy for the engine. The most common cause for excessive oil usage (in the N54 engine) is a compromised Positive Crankcase Ventilation (PCV) system. The N54 PCV system is a poor design in the first place and allows, what most would consider to be, an excessive amount of oil vapor to be introduced into the intake system. This is the root of the need for periodic walnut media blasting of the intake ports and valves. Now that these engines have increased age and/or miles on them, the PCV systems are showing signs of failure along with the associated increase in oil consumption. This shows itself as oil smoke through the exhaust and an increased need for adding oil to the crankcase. The excessive oil running through the intake system can actually collect in low lying areas (such as the intercooler) and greatly increased the build-up in the intake ports and on the intake valves. The N54 (and most late-model turbocharged engines) employs two PCV circuits. One that operates under no/low boost (from intake vacuum to low boost) and a second that operates when the intake system is under actual boost (pressure in the intake system). Each of the systems employs check valves to direct crankcase venting and to prevent boost pressure from entering the crankcase. Either of these systems can degrade and fail to properly vent the crankcase and/or allow boost pressure to reach the crankcase. 1) The check valve is weak and tends to leak boost pressure back into the PCV ports and into the crankcase, causing oil usage through the valve guides and past the piston rings. The original valve is technically non-replaceable. However, BAVauto offers an upgraded valve from FTP, which installs in place of the original valve and not only renews the valve, but is capable of holding higher boost pressures without leakage. 2) The PCV ports that run internally through the valve cover and to the ports in the cylinder head (and ultimately into the intake ports) are sealed by the valve cover gasket. An old, worn, valve cover gasket can allow leakage between the ports in the valve cover and the cylinder head. This causes two separate problems; a) Under intake vacuum, oil can be pulled into the ports, b) Under boost, boost pressure can leak past the gasket (through the ports in the head) and pressurize the crankcase, causing oil usage through the valve guides and past piston rings, as well as increasing the PCV flow through the secondary PCV (Boost) system, which will increase oil vapor flow. Replacing the valve cover gasket AND applying a small amount of gasket sealant around the PCV ports (being careful not to apply in a manner that would “squish” and clog the ports) is the fix for this issue. The secondary, or “under boost” side of the PCV system employs a check valve that is internal to the PCV hose that runs from the rear of the valve cover to the intake tube. The original check valve can fail and allow boost pressure to enter the crankcase, causing oil usage through the valve guides and past piston rings, as well as increasing the PCV flow through the “low side” PCV system, which will increase oil vapor flow as well. Replacing the PCV hose, provides a new check valve.